Raw leafy vegetable salad tossed with a dressing is not a native concept in Filipino cuisine. Serving a garden-style salad ahead of the main dish was not a native practice either until the Americans introduced it during the colonial period that began in 1898 and ended in 1946, and urbanites slowly adopted it. Serving side dishes made with vegetables are, however, a native practice. They were not considered salads in the Western context but more of the plant component in a meat or seafood meal. Think of them as a desirable accompaniment, not exactly essential but their addition turns generic fish and rice, for instance, into a uniquely Filipino meal. The most ubiquitous mixture would be diced salted duck eggs and tomatoes, which needs no dressing, as the natural tartness of the tomatoes and the saltiness of the duck eggs provide all the flavors that the mixture needs. There are green mangoes, tomatoes and onions tossed with bagoong (fermented fish or shrimp paste), the Filipino equivalent of the Indonesian and Malaysian belacan. Either can go with grilled or fried chicken, meat or fish. Then, there's lato (a local seaweed that looks like miniature grapes) dipped in freshly-squeezed kalamansi juice, a traditional accompaniment for grilled fish. If you're living in the Western hemisphere and have no access to ingredients like salted duck eggs, green mangoes, bagoong or lato, you can still have a taste of traditional Filipino side vegetable dishes in another form—pickled vegetables. These native pickled vegetables are called "buro" and the process of pickling is called "binuro", a method of preservation. The pickling solution can be sweet and sour (as in the case of atsara which is made with green papaya), salty or salty and sour, depending on the regional origin and the food to be pickled (the term and process are also used in fish and other seafood preservation). There is also a school of thought that it is not "binuro" unless allowed to ferment for a couple of days. In this recipe, a medley of vegetables is soaked in a sweet and sour pickling solution. Fermentation is skipped and the pickled vegetables are kept in the fridge. 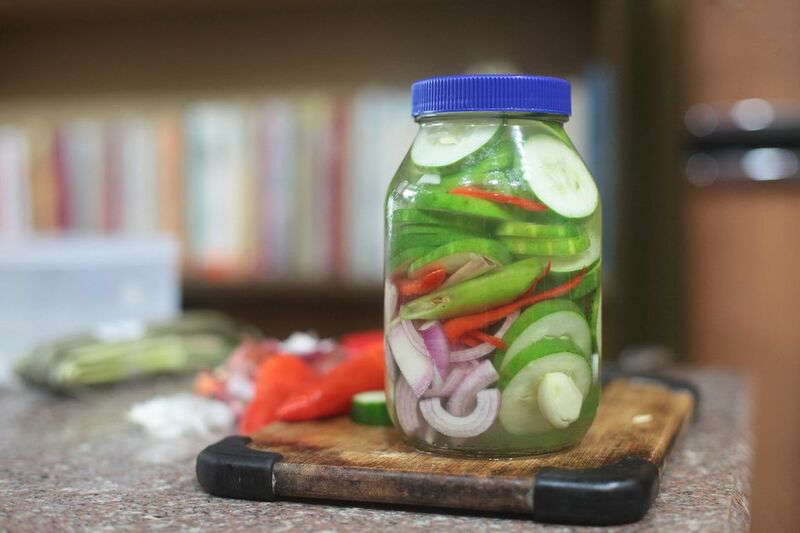 Make the pickling solution. Pour the vinegar into a small saucepan. Add an equal amount of water. Stir in the sugar. Boil until the sugar dissolves. Cool. Stir in the fish sauce. Stuff the rest of the ingredients in a jar with a screw-type cap. Pour in the cooled pickling solution, making sure that every piece of vegetable is completely submerged. Screw in the cap and keep in the fridge until needed. Note that it is best to let the vegetables soak in the liquid for at least 24 hours before use. Serve the vegetables with some of the liquid or drain them, it is entirely up to you. If you want to add lettuce leaves, toss them in just before serving. The vegetables will keep in the fridge for a couple of days. I have done several experiments and, beyond a week, the cucumbers start to lose their texture. The onions and bell peppers, however, benefit even more from prolonged soaking. If you want to add tomatoes to your mix, scrape off the seeds and soft centers, and discard before stuffing into the jar with the rest of the vegetables. Use within two days.